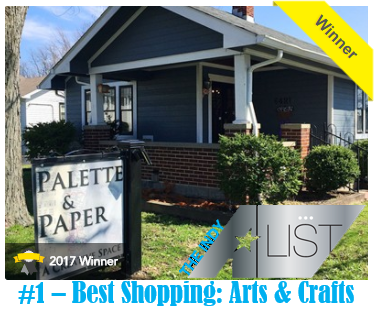 Palette & Paper, a Paper Arts Shoppe and Studio, is locally-owned and operated by Mare and Bill Mullineaux. Mare has an extensive background in paper arts and a variety of other techniques and crafts. She felt a calling to focus on the “community” of crafting, and the idea of Palette & Paper was born in 2014. Mare shared, "The mission of Palette & Paper is to offer a comfortable and inspiring space in which to be creative by either attending a class, or working alone or among a group of friends. The goal is to provide a warm atmosphere where friends can gather, as if in my home, complete with a beverage, comfy seat, and an inspiring magazine to peruse . . . but without all the cat hair!" Palette & Paper offers a wide and varied array of supplies for paper crafting, rubber stamping, scrapbooking, card making, mixed media, bible journaling, art journaling, planners and so much more. Our store is located in a home because we want you to feel like family when you browse the rooms filled with paper, cardstock, adhesives, pens, coloring books, magazines, many styles of embellishments, tons of tools, ink pads, wood and acrylic stamps, organizational supplies, stickers, washi tape, acrylic paints, watercolor paints, brushes, and much more! 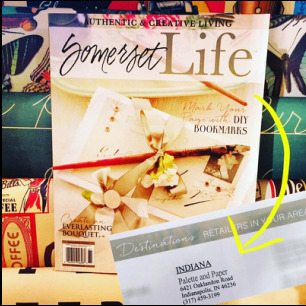 All skill-levels of crafters will find just what they are looking for at Palette & Paper. The inventory changes and grows constantly, so be sure to stop by often. Looking for something in particular, please share it (drop us a line or share when you are in the Shoppe). This is such a beautiful place! The products they sell are unique, exciting and trendy! The shop set up is absolutely wonderful! Their Open House was fabulous. I can't wait to sign up for classes come 2016. - Michelle K.
Mare made us feel so comfortable and welcomed. The paper crafting supplies and decor of the charming house were a feast for the eyes. I look forward to taking classes, going to crops and shopping trips to Palette and Paper. - Cindy P.
What an amazing place! So many awesome things to take in and drool over. You can certainly feel a creative vibe here. I absolutely love this place! The store and the classes are wonderful! If you are a scrapper or a crafter you must stop in and take a look. Mare, the owner, will be happy to show you around. -Rita M.
Amazing community of artists. Soulful, creative people who support one another and are open to learn and grow. 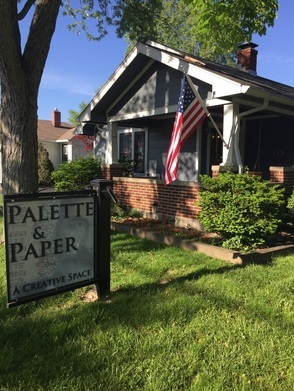 Palette & Paper has filled a void in the Indy art/craft scene with it's unique approach. They have a fantastic retail store that offers paper arts, scrapbook and mixed media items you can't find anywhere else locally. Also, they have created such a "community" with their class offerings, paper arts group, crops and more. Artists and crafters of all levels are welcome. With Palette & Paper you aren't just a customer, you are a friend. - Kimberly E.
I was visiting Indianapolis and someone online recommended that I stop by. I met one of the instructors outside coming out of the "studio" and she took me in through the kitchen! I knew it was going to be amazing before I even stepped through the door! It was amazing! I could barely contain my excitement. Actually, I don't think I did contain it! Mare and her husband, Bill were awesome and showed me around. Then they let me just look! I can't wait to go back. It may be a long drive from NC; but, I feel like I have a new home to come to! A home where all of my crafty dreams can become a reality! - Michelle G.